This is kind of a sad story, and it was definitely a learning experience for me, but the point of traveling is to get out of your comfort zone and learn about the wider world, so I guess this counts as that. Cambodia is a very poor country, I looked it up, and the average annual income for a Cambodian family is only $750 US per year. There are a lot of children who are poor, homeless and hungry, and a lot of children who are used by their families in order to make money, taking advantage of the visitors to the country that want to help where they can. We were chatting with a Cambodian man on one of our first nights in Siem Reap, and he was telling us about some of the schemes that people use to try to make money off of their children, including having tourists buy rice for hungry children, and then returning it to the store after they leave, and splitting the profits with the store owner. The tourists want to help the hungry children, and figure since they aren’t just giving them money, but actually buying them food, that they are really helping, but then the rice is returned, and the money is split between the adults, and often the children don’t get anything out of it. A few nights later, we were walking through the night market in Siem Reap, and a little boy, about 13 years old, came up to me, carrying a young child, less than two years old. He told me that his little brother was hungry, that he didn’t want money, or anything for himself, but just begged me over and over again to get some milk for the child. I still had that story in my head, so I was pretty cautious, but I decided to go along with him, because if there was any chance that he really did just want to feed his brother, I wasn’t going to say no to that. I was kind of suspicious right away, since the child was carrying an empty, and totally spotless sippy cup, that had never had anything in it, it kind of seemed like a prop. He also took me to a store about a block away, we didn’t pass any other stores, so it wasn’t openly strange, but he was quite intent on going to one certain store, so I thought that was a bit suspicious as well. As we were walking into the store, another obviously tourist couple were walking out, and I just had a bad feeling. He followed me in, and tried to get me to buy a canister of baby formula, and tried to get me to buy the large, expensive one, by telling me that the child needed that one because of his age, even though the smaller canister was exactly the same. At this point, the store door opened again, and another boy about the same age walked in with another tourist, and I heard the guy asked where he could find baby formula. I realized then that it was definitely just a money making scheme, and apologized to the boy and tried to leave, but he wouldn’t let me. He blocked me in the aisle, kept grabbing my arms and wouldn’t let me leave. I didn’t want to force my way past him, he was young but he was almost as tall as me, and I didn’t want to hurt the child that he was holding, but he wouldn’t let me go. Eventually I managed to get by him, but he followed me out of the store, yelling at me and grabbing my arms. When he finally realized that I was leaving and I wasn’t going to buy him anything, he swore at me, and grabbed the back of my arm, pinching me as hard as he could. He started to walk away, and then punched the little boy he was carrying out of rage. It made me sick, and I felt horrible, for the little boy, and also for the older one, because I wasn’t sure if he was going to get into trouble. The reason I shared that story is because I learned the hard way that there are good and bad ways to help. When you give children who are begging on the street money, and they become a viable income for the parents, it can cost them opportunities for education, since they are spending all of their time trying to earn money. But there are good ways to help as well. 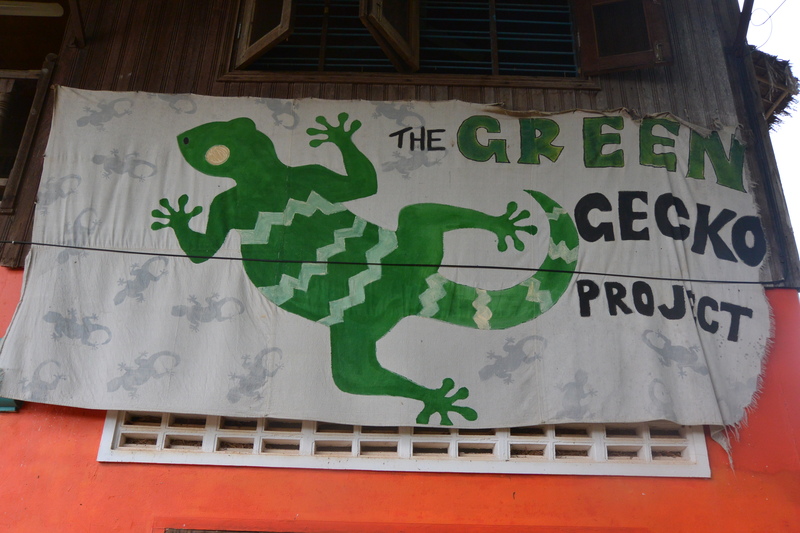 We learned about the Green Gecko Project through talking to some locals in Siem Reap, and decided to pay a visit. It is a school for former street kids run by a local Cambodian man, and his Australian wife. It started as just a one room school where kids could come to learn and get at least one good meal per day. It’s been nearly 10 years since it started, and some of the kids they started with are going off to university, law school, or pursuing internships in music and the arts. They currently have 75 students, and do a lot to support former students, and the community in general. They have visiting hours every week day, so if you are in the area and want to stop in, make sure it is during those hours. You can also check on their website, they have a wish list, including toothpaste, soap, clothing, shoes, that they are always in need of, if you’d like to help. They also accept volunteers, so if you have a special skill that you can teach, art or web design, or dance, etc and you’d like to spend some time in Cambodia, reach out to them. You can learn more about the Green Gecko Project here.